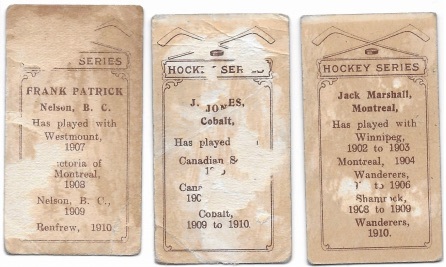 Showing that there are still great hobby finds to discover, an over 100-year-old set of hockey cards was recently purchased by Just Collect. 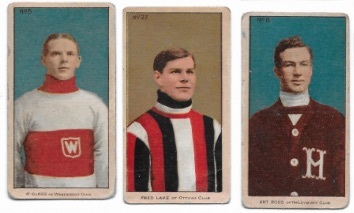 The 1910 C56 Hockey collection consists of a near-complete set, with only one of the Art Ross cards missing. This all came to be when a collector from Florida contacted Just Collect for a free estimate. The collector actually hails from Canada, which is where the C56 set originated. This interested seller provided as many details as possible, including photos and a complete card list, which made it much easier for Just Collect to assess the value of the collection. As they were stored in a binder by the owner's father, the cards have excellent eye appeal. Unfortunately, because they were affixed to the binder and had to be removed, damage occurred to the back of the cards, dropping their overall grade significantly. Just Collect sent several examples to PSA for grading with plans to auction them in the future. As many collectors are aware, 1910 Imperial Tobacco C56 is viewed as the very first hockey set and a landmark option for early Hall of Fame players. The 36-card set actually predates the NHL, covering players from the 1910-11 National Hockey Association (NHA) season. When collectors want to part with their collections, they often go to eBay or other online sources to determine the value of their cards. Although quick and easy, this can lead to a gross over-assessment of value since collectors gravitate to the more expensive and high-grade cards, assuming theirs are comparable. Upon further review by an expert, most collectors should probably expect to find out their cards are usually worth less than they would hope. This is where Just Collect comes in. If you have valuable cards and are not sure of their exact worth or condition, Just Collect will provide a free estimate so you can determine the actual market value of your collection. This is especially important if you have a very high-grade or rare item in your possession. If you are still holding onto your old hockey cards, or collectibles from a different sport, you may want to get an updated quote on their current value. The vintage sports card market has seen record spikes as of late, which makes a current assessment even more important as you don't want to miss out on the peak values. The Cardboard Connection only partners with the most trusted dealers in the industry, assuring you will be treated honestly and fairly as you consider parting ways with your treasured items.